After yachting with Springsteen and kitesurfing with Richard Branson, Barack Obama is finally starting to settle into his post-presidency life. And while you may have a hard time accepting that his presidency’s truly over, you’ve got to admit he’s earned some time to kick back and do him. So for die-hard Obama supporters, here’s some exciting news: This morning Barack Obama launched his first drone strike as a civilian! Wow. Does 2008 still feel like yesterday to anyone else? 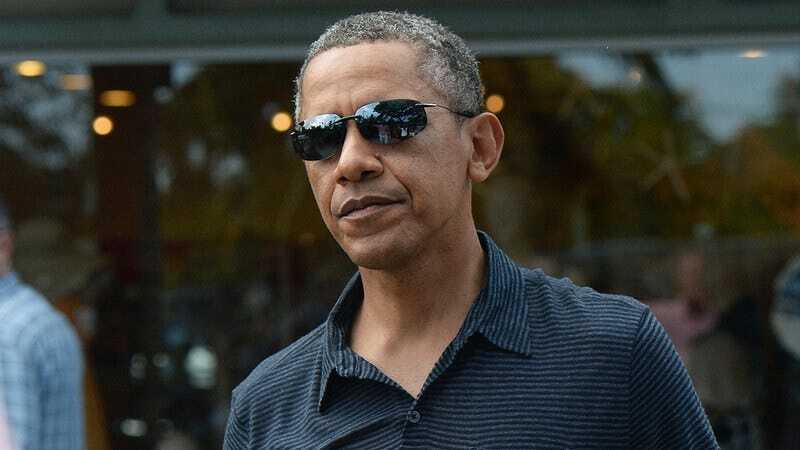 Looking rested and rejuvenated, Obama ordered the drone strike on a compound in Yemen as he lounged in sweatpants and an old Harvard Law sweatshirt in the backyard of his Kalorama mansion. Since leaving office, the newly minted private citizen has stayed out of the spotlight to prioritize family and relaxation, so being able to fire a pair of Hellfire missiles at suspected al-Qaeda commanders with a cold beer in hand and no joint chiefs breathing down his neck must be a real relief. Honestly, to us, it sounds totally relaxing! Shortly after ordering the strike, Obama went for a jog through his new D.C. neighborhood, radiating a healthy glow, blissfully ignorant of the U.N. observers estimating upwards of a dozen civilian casualties from a schoolhouse inside the compound. Without the constant drumbeat of classified briefings and press conferences to worry about, it’s nice to see Obama is able to loosen his tie and focus on good living, personal projects, and extrajudicial targeted killings like this one. And to that we say, well deserved, sir! For his supporters, Obama’s return to the news has been a much-needed reminder of a presidency that already feels like a lifetime ago. By sending a Predator MQ-1 drone to rain death onto America’s enemies abroad, Obama’s made it clear that his post-presidency is going to be just as buzz-worthy as his presidency was. So whether he’s dropping Malia off at Harvard, blowing up an Afghan convoy, or just playing some pickup basketball, expect to see a whole lot of eyes on our 44th president! Whatever your politics, you have to agree: It’s going to be fascinating to watch Obama the ex-president’s next moves.